Inventory We are a resale marketplace, not a box office or venue. Ticket prices may exceed face value. This site is not owned by Tyson Events Center . The Gateway Arena is a multi-purpose arena inside the Tyson Event Center, located in Sioux City, Iowa, also known as "The House", "The Bank" or "The Igloo" is sponsored by Tyson Foods and Gateway, Inc. The arena has three spectator levels: one suite level and two general seating levels named the 100 level and the 200 level. Its official capacity is 10,000. It is located on the riverfront overlooking the Missouri River. It is home to the Sioux City Musketeers, of the United States Hockey League (USHL) and the Sioux City Bandits, of the American Professional Football League (APFL). 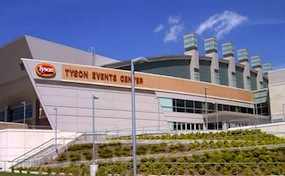 TysonEvents.CenterSiouxCity.com is not affiliated with any primary box office or supplier. We are a privately owned and operated business specializing in sales in the secondary market. To buy tickets for any Tyson Events Center Gateway Arena in Sioux City simply click on the event of interest or call our operators at anytime.